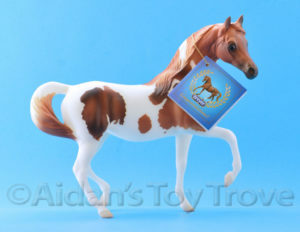 Breyer is offering a free Glossy Cosette to Collector’s Club Members with purchase of $100 or more. The offer is good through 12/13/16 or to the first 500 people to redeem the offer which would theoretically make the Glossy Cosette a run of 500. 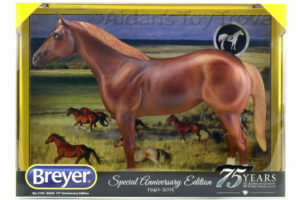 This is is more than a typical Breyer limited Web Special Run of 350. I think the chances of Breyer distributing all 500 Glossy Cosettes with this offer is slim to none. Whether they will distribute the left over Glossy Cosettes in some other manner or only gloss the number ordered is a bit of a mystery. 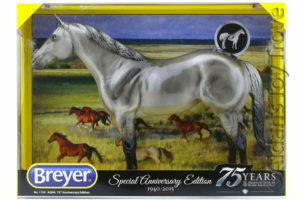 I think that this is a good offer if there is something on Breyer’s website that you have been itching to order. For me, it’s a pass. I personally own the matte Cosette. If you would like to see more pictures of the matte version (versus Breyer’s stock photos) you can see my matte Cosette’s gallery here. Free is a relative term. Breyer’s Free Shipping offer is now gone. Membership dues to the Collector’s Club, Premier Club, Vintage Club and Stablemate Club do not count towards the $100 minimum order. Nor do any of the models from the aforementioned clubs qualify, ie. Yasmin and Django. As the glossy Cosette is ‘free’ I do not think Breyer will exchange her if she is flawed. Personally, I would rather hunt for a nice relatively flaw free specimen on the secondary market. 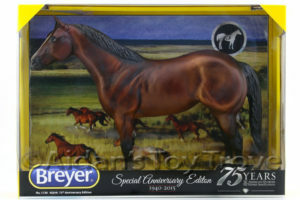 Last year, Breyer offered a chance at a glossy 1730 AQHA 75th Anniversary Quarter Horse in either glossy grulla or glossy chestnut. 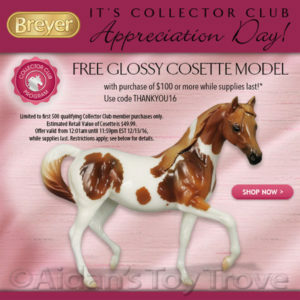 This year, Breyer is more or less guaranteeing a glossy Cosette to the first 500 people to redeem their offer. 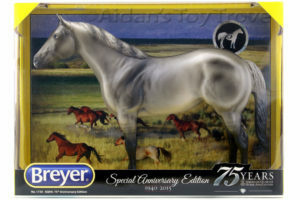 This is a good move on Breyer’s part as there were a lot of frustrated Collector’s Club members last year that received a matte 1730 AQHA 75th Anniversary Quarter Horse that they didn’t really want. You can see my Glossy Grulla 1730 AQHA Anniversary Quarter Horse here. To get the glossy, I ended up with *a lot* of matte 1730 AQHA Anniversary Quarter Horses! Some of which I still have for sale. Bay with and without eyewhites! The bay had spectacular shading. But to my knowledge was not glossed. You can read more about this variation at the link above. This is the only color that I received the eyewhite variation on. Chestnut (who actually has lovely shading just like the bay.) I did not receive the glossy Chestnut. Bay roan. The roan had a lot of variation in the density of his ‘roaning’. Some were more speckly and others closer to solid white/grey. Grulla. The color on this one is spectacular and is my personal favorite. Breyer also produced a Black and Palomino which I did not receive. So, will YOU be getting a Glossy Cosette? 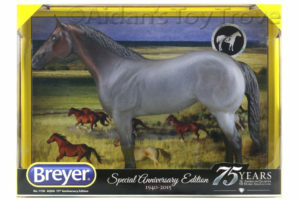 « Breyer 2017 New Releases The Traditionals!